It’s Tuesday and time for Slice of Life with Two Writing Teachers. Thanks to Dana, Tara, Stacey, Betsy, Anna, and Beth for the wonderful place to meet up. Read more slices and link up with your own here. A few weekends ago Chris Lehman’s EdCollab Gathering presented an online workshop. How lucky we are to have such access to so many powerful ideas and educators. I watched Sara Ahmed’s session on capturing Middle School hearts and minds. She spent 45 minutes highlighting some wonderful ideas she uses in her San Diego classroom that makes me want to preorder her new book, co-authored with Harvey “Smokey” Daniels. 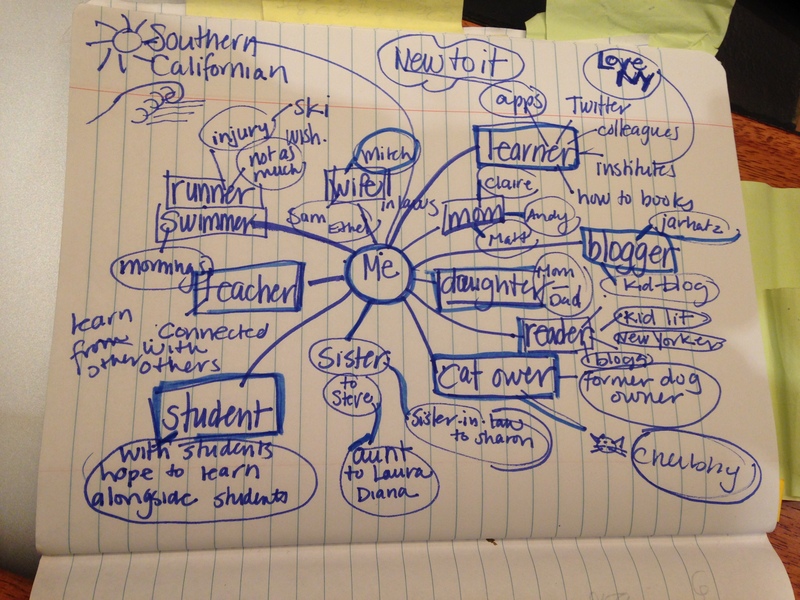 In her session, Sara showed how she and her students create a sort of identity chart or “Me” map. I’ve done things like this before, but I wanted to see if it would help me, and maybe my kiddos, find some inspiration for slicing. Sometimes you just need a new tool! I let my map sit for a while. Then up popped that midnight wakeup call. It was Wednesday, actually Thursday morning, and my daughter woke me up in a panic. Ok, how hard can this be. I weave into her room heart pounding from the adrenaline surge still coursing through me. I pull out the text book. Oh my. An excerpt from Emerson’s Nature is three pages amidst this massive 600 page, 10 pound text that covers all of American Literature in tiny pieces. My reaction: Can we Google it? Seriously isn’t that what any resourceful person does? Ok. I try to read the text and make sense of the rubric. It was way above my reading level, at least at 1 am. I don’t think I could pass 11th grade AP English. Certain that all her hopes and dreams were destroyed, she dissolved into tears, cursed my ineptitude and wished her brother was home to help. The next evening, she presented me with a well-written piece. But how? Brilliant. She has her own PLN. This girl will survive. The happy ending was filed away. Meanwhile, my reader self and my teacher self all coalesced with Sunday’s #titletalk chat on reading levels; triggering some older memories. When I was 10 years old, I wasn’t much of a reader and not much of a test taker. By today’s standards, I would not have met Common Core expectations. If I was a young person today, my very literate, educated parents would have worried about low scores (because I probably would have had them), blamed it on the media or maybe the teacher. I wouldn’t have measured up. Had I been given my daughter’s English assignment at 16, I mostly likely would have failed and had another reason not to like reading. Fortunately I didn’t have that text as an 11th grader. I had a teacher who read short story with us: complete, unabridged stories by Hemingway. We read and discussed as a class. We wrote. We were taught as long as we had support for our theories in the text, our point of view would be considered. It was a community of readers, talkers, and thinkers. It was fun. This class made me want to pursue literature classes in college. Mr. Flagler changed my reading path. As parent conferences and the grading period approaches, I will tell my students and their parents the story of my 10-year old self. That we measure student’s reading level only as a tool to understand how to help them become better reader; not to measure their worth or their future success. That we spend our year focused on growing their love of reading while working on their reading skills, so they want to do and can do more of it as they go through their school years and beyond. I am grateful for my 11th grade literature teacher and will keep him and my experience close as I confer with my students. Thank you so much Mr. Flagler. For allowing me to fall in love reading and the possibility it holds out for all of us. I hope I can measure up. Slice of Life: Parent Conferences, What’s the Verdict? Oh Julieanne, there’s so much beauty in these words! My favorite line, “Brilliant. She has her own PLN.” That’s awesome!!! To be so wise at such a young age…what a terrific girl!! Mr. Flagler sounds amazing. I’m with you, I would struggle with these tests if I were a student now! I love how you use your experiences and reflect on students today. Great post, as always! I think this gets lost too often. Thanks for the reminder and for sharing such wonderful story. Oh yes, I would be struggling with the expectations set forth by the CCSS today. I love how you know what’s important and share that with your students and their families. Your writing is a gift I look forward to reading each week. Love your resourceful daughter’s PLN – not sure I would have known what to do with that midnight call. I hope that this is what my kids can say of their experience in my room :It was a community of readers, talkers, and thinkers. It was fun. I also don’t think I would measure up with Common Core standards. I know that at midnight I would be totally useless on any kind of assignment; So glad things worked out for your daughter. Thank goodness for all the teachers out there like Mr. Flagler who allow students “…to fall in love reading and the possibility it holds out for all of us.” Your words are powerful, (“…we spend our year focused on growing their love of reading while working on their reading skills…”) and show that you are indeed following in his footsteps. I hope you can share this post with him. This was beautiful. I like how your thoughts traveled. I love the PLNL line too and how the me map works much like Atwell’s writing territories. Sometimes that new tool or fresh take is all the inspiration we need! I teach AP Language and had to groan at the no-Googling Emerson assignment. My students struggle with Emerson and they need my support as well as any resource that helps them make sense of his dense text. Good for you for not blowing one assignment out of proportion and for seeing the good your daughter has and does as she finds her way through it. I’ve often been thankful I was educated in a kinder fashion. I’m thankful your students have your kindness. Yes! “We measure student’s reading level only as a tool to understand how to help them become better reader.” I wish more people understood that this is what our work is really about! And I’m sure Mr. Flagler would be very proud of you! Oh my gosh! I feel you, Julieanne! I too have had those late night calls to help with AP lit assignments – the most recent I’m still reeling from. Compare one of three poems to specific parts of the book they were assigned over the summer (um, this is October) Kahil Gibran. So saddened by assignments like this and SO wishing for a Mr. Flagler in my 17 year old’s life. I want to try the Me Map too. Bet your students will enjoy doing them. Always – thank you for sharing your learning journey!